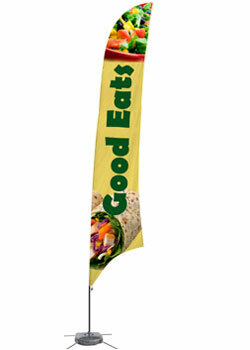 Event Flags Are Great Promotional Tools That Can Attract Business. These items can be bought at very low prices. There are thousands of other event flags available here. 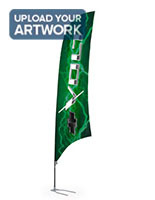 Giant outdoor event flags can easily be seen across a room or field! 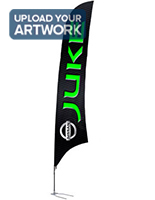 Digitally printed feather banner great for complex designs or photographs. Carrying bags easily hold event flags for transport to & from events. Cross base with water bag provides stability for use outdoors. 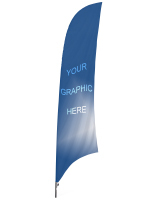 These event flags include a cross base for insertion of the pole. 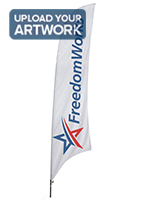 This cross base folds small for easy transport, and can be used to display your custom promotional banners in either outdoor or indoor locations. The kit also includes a cross base and water bag for placing at outdoor venues. 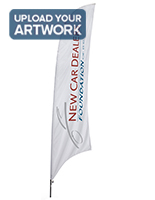 The feather banners, event flags feature digitally printed CMYK graphics. 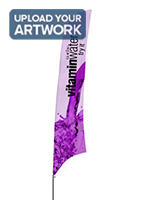 These custom banners are great for more complex designs featuring photographs or gradients. For your convenience, the event flags can be ordered in any quantity, as there is no minimum purchase requirement for digitally printed units. Unlike silkscreened banners, these advertising stands do not penetrate the fabric fully. As a result, the back side of the fabric does not have as vivid an image as the front. Custom banners, like these event flags, can be found at trade shows, convention centers, and even outdoor venues. 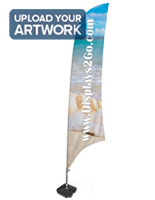 This promotional product is used to inform the public and direct attention.This custom feather flag uses a water bag to weigh down the base to provide more stability. This lightweight outdoor banner draws attention to any business or event easily, as it utilizes personally designed graphics to convey your message. Please note: These event flags are NOT designed for use in winds exceeding 20mph. This base is not designed specifically for outdoor use by itself. When used outside, we recommend using the included water bag for extra weight.